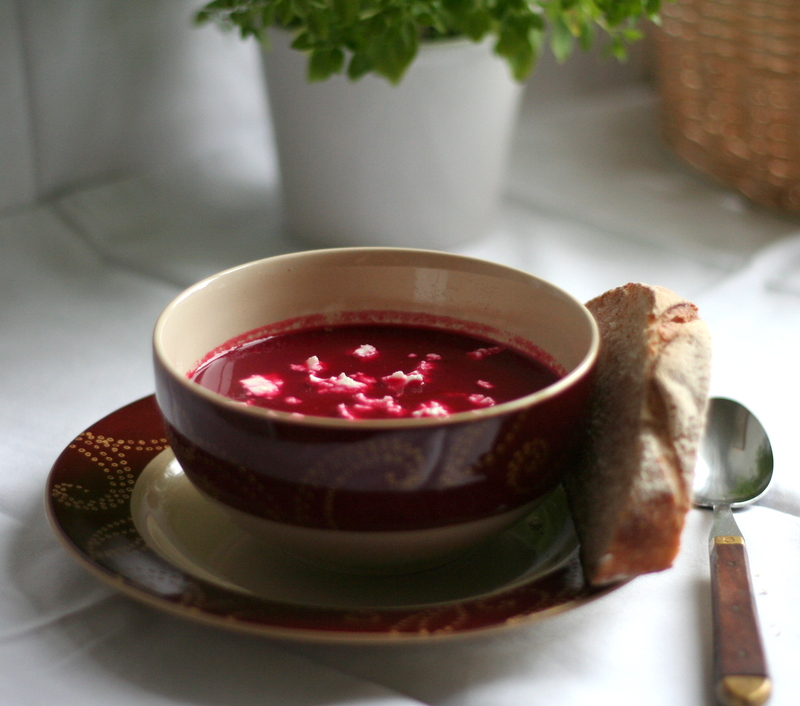 If you have already-cooked beetroot to hand, this ruby-coloured soup is quick and easy to make. You can also make it with ready-cooked beetroot that comes in vacuum packs. Make sure you look at the pack in case it’s preserved in vinegar. I once made that mistake, thinking that pickled beetroot always comes in a jar. It doesn’t! Heat the oil in a large pan and gently fry the onion and garlic until the onion is soft. Add the allspice and fry for 1 minute. Add the potato and the carrot and fry for 2-3 mins. Add the beetroot, the lemon juice and the stock and bring to the boil. Cover and reduce the heat and simmer for 20 minutes or until the vegetables are tender. Remove from the heat and leave to stand for a few minutes. Ladle into a liquidiser in batches and liquidise until smooth. Return to the pan and add the lemon rind. Serve in bowls with feta crumbled over the top. Tags: beetroot, feta, lemon zest.